The wait is over. Blood City has landed - available to download from today on Kindle, iBooks and Kobo. The physical paperback can be ordered direct from the Luath website, and many other bookstores. Glasgow’s mean streets just got meaner. Can Davie McCall survive? Meet Davie McCall – not your average henchman. Abused and tormented by his father for fifteen years, there is a darkness in him searching for a way out. Under the wing of Glasgow’s Godfather, Joe ‘the Tailor’ Klein, he flourishes. Joe the Tailor may be a killer, but there are some lines he won’t cross, and Davie agrees with his strict moral code. He doesn’t like drugs. He won’t condone foul language. He abhors violence against women. When the Tailor refuses to be part of Glasgow’s new drug trade, the hits start rolling. It’s every man for himself as the entire criminal underworld turns on itself, and Davie is well and truly caught up in the action. But an attractive young reporter makes him wonder if he can leave his life of crime behind and Davie must learn the hard way that you cannot change what you are. 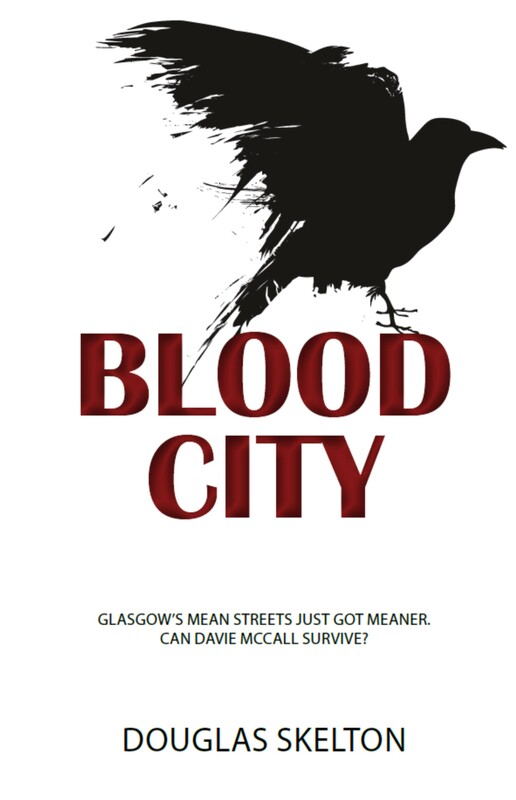 Blood City is a novel set in Glasgow’s underworld at a time when it was undergoing a seismic shift. A tale of violence, corruption and betrayal, loyalties will be tested and friendships torn apart. When Davie McCall bobbed to the surface of consciousness, he was aware of the voices drifting around him. Hushed voices, and he did not recognise any of them. His vision swam as he opened his eyes and he didn’t know at first where he was. There was a blue curtain around him, darker lines waving as if he was seeing them through water. And there were other sounds; the squeak of shoes on polished surfaces, sometimes the clink of cutlery on a plate and even, faintly, the harsh sound of laughter on a television. But then he would be dragged back down into the depths, unconsciousness washing over him and sweeping the sounds away once more. And each time he was back in that dingy room where the firelight guttered and the stench of blood hung in the air. Back in that room with his father standing over him, the heavy poker wet and glistening in his hand, his face frozen in rage, his eyes cold, distant points of blue ice. And Davie again felt the pain in his arm and the ache in his head, and tasted the blood from his scalp as it trickled down his face to his lips. And he felt the fear as his father turned those dead blue eyes on him. Then, mercifully, the deep claimed him again and he was carried away from that place with its pain, and its terror, and its blood. Not his blood, of course. It was not his blood that clung to the memory of that dark room. Not his blood. Not his. WHEN AT LAST Davie fully burst through the silky surface of consciousness, he knew immediately that he was in a hospital. His previous surges back to the world had been brief affairs, when he had registered the sounds but not the smells. Now he knew he was in a hospital ward, for not only did he recognise the squeak of nurses’ shoes on the floor and the muted conversation of the other patients on the ward, but also the smell of disinfectant and, for some reason, boiled cabbage. As he lay on his back he opened his eyes and saw the cracked plaster in the cream ceiling high above his bed. Pale, watery daylight leaked through a window to his left. Surrounding him he saw the light blue curtain with its ragged darker lines and finally the unmistakeable figure of Joe the Tailor beside his bed. Immaculate as always; the trademark deep navy coat, unbuttoned to reveal his blue suit, white shirt and dark red tie. Davie couldn’t see it but he knew the Tailor’s grey Homburg would not be far away. The old man sat straight-backed in the foldaway wooden chair, one knee crooked over the other, his perfectly manicured hands clasped on top. He might have been praying, but Davie knew he had given that up a long time ago. He also knew, without asking, that the man had been sitting there for a long time. Joe Klein smiled gently when he saw the boy’s eyes snap open. ‘Glad to see you are returned,’ he said, his voice carrying the faint echoes of a Polish childhood. ‘You are in the Royal Infirmary. Do you know why?’ Davie tried to pull himself up, but found his body unwilling to obey. The Tailor reached out and placed a hand gently on his shoulder. ‘It is best that you remain as you are,’ he said. Davie looked at the hand, at the ring that sparkled on the pinkie, and beyond that his own right arm, encased in plaster. He raised his left hand to his forehead and felt the bandages encasing the top of his head. ‘Yes.’ Davie’s voice rasped and for the first time he realised how dry his lips were. He tried to lick them but his tongue was cracked and barren of moisture. The Tailor nodded and leaned forward with a glass of amber fluid with a straw. He placed the straw between Davie’s lips and said, ‘You must drink. They have left water but this is better.’ The delicate scent of the old man’s cologne was comforting as Davie sucked on the straw and felt the fizzy liquid bite at his tongue and throat. ‘The Irn-Bru,’ said Joe, smiling again. ‘The bringer of life.’ Davie drained a strawfull. Joe replaced the glass on the cabinet and sat down again. He shook the folds of his coat until they hung correctly then draped his leg over his knee once more before letting his hands resume their clasped position. ‘Where is he?’ Joe didn’t need to ask who Davie meant, for he had expected the question. ‘They do not know,’ he replied. ‘He has vanished.’ Davie nodded, knowing instinctively that his father would not have allowed himself to be caught. ‘He came to me, after,’ said Joe. ‘I phoned the police myself. That kind of behaviour must not be tolerated. They will catch him, or we will, sooner or later.’ Davie knew the old man meant what he said, but doubted that his father would ever allow himself to be caught. He knew Danny McCall too well. A madman he may have been – Davie still recalled something not of this world glinting in his father’s eye that night – but Danny McCall would have been aware that he had crossed a line. It wasn’t just the Law that sought him now, but Joe ‘The Tailor’ Klein as well, for he had broken one of his cardinal rules. Thou Shalt Not Harm a Woman. There was enough of the father in the son to make him certain that Danny McCall would move heaven and hell to ensure he was not found. Joe Klein was a bad man to cross. ‘The police will wish to talk,’ said the Tailor. ‘You must assist them.’ This, Davie knew, was an order and there was no possibility of him not obeying. He nodded his agreement as the curtain behind the old man flipped back and the hulking form of Rab McClymont loomed over the bed, two small white cups of tea gripped in his big hands. He was only 21 – just six years older than Davie – but he looked far more mature, thanks to his size and the heavy beard darkening his cheeks. His wide jaw and shock of black hair made him look like a live action version of Desperate Dan. Davie shook his head. ‘Give us that glass down, though,’ he said. ‘It is the amber nectar of the gods,’ said the Tailor with a smile. ‘Sorry, mate – here.’ Rab handed over the glass and Davie took it with his good hand. He struggled to sit up and Rab put his own cup on the cabinet top in order to give him surprisingly gentle assistance. Davie nodded his thanks before he drained some more of the liquid and looked at the Tailor. Davie lay back on the pillows Rab had helped prop up and looked out of the window, its surface speckled with rain. The dark grey city stretched out beneath an iron sky. Cars moved down Castle Street towards High Street and further on he could see the top of the Tollbooth Steeple at Glasgow Cross. He stared at the serrated edge of the city skyline etched against the dark clouds. The Tailor had said he must get better, but Davie seriously doubted he ever would. At only 15 years old, Davie McCall knew there was darkness within him with which he would have to come to terms. And that prospect scared the hell out of him.